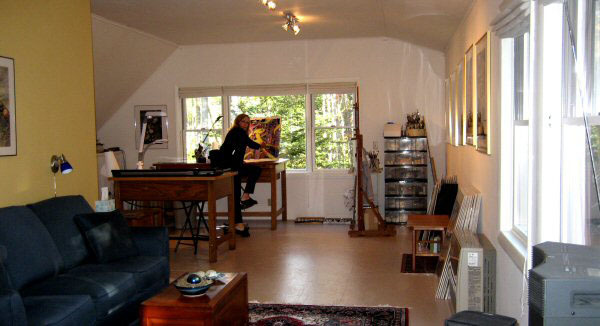 My studio was designed and built to accommodate my need for multiple-use spaces. The largest area is under-counter storage for materials, paintings, and supplies. 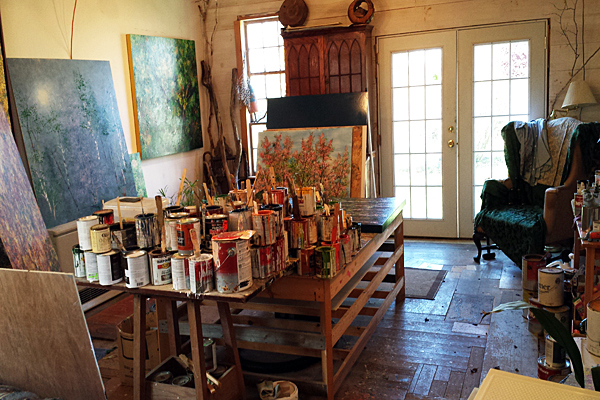 Adjacent to that is a large oak table where I create watercolor paintings, and to the right is my easel and stand for oil painting. The large windows by these areas face north for natural light. In the middle of my space stands a smaller oak table that I use for matting and framing. Because the entire space is 36’ x 24’ I was able to put in a sitting area with shelves that house art books, where I can study and read. Behind that area is a large full bathroom, and at the south end of the studio is a screened porch with seating. This configuration allows me to move between settings as I engage in painting, reading, thinking, and planning. I employ action painting techniques, so I need room for movement (my studio is 16 x 30 feet with an open ceiling plan). I typically work with house paints recovered from discard sources and usually work with 20-25 cans at a time. While my paintings evolve as an intuitive process, there is the actual ebb and flow of the paint itself, which I use to create, form, and build texture. Brushes interrupt this process; hence, I use no brushes, but work with torn shapes of lightweight cardboard, and, at times, plant material. Objects in my studio–such as lichens, mosses, tree bark–provide symbolic reference to the natural world. Drying rack space is below my work table and above in the loft. In the summer, I paint outside in space adjacent to my studio — this space was the foundation of an old greenhouse and now is enclosed by climbing ivy, a cluster of trees, and a beach-sand floor. This is a panoramic view of my shop, located in Brunswick, Maine. It’s more shop than studio because my work requires machines to cut, weld, and forge aluminum and steel. I work on several different projects, alternating as they go through the process of completion. Process is a strong component of my sculpture; working with materials in the real world requires it. I have moved from traditional realism to more imaginative or abstracted imagery of the real world. Some of my work–the landscapes and cityscapes, which are derived from or influenced by the Hudson Valley and New York City–is modular and assembled using a grid system. Some of my newer work is made from wood and steel, open in form but linear in the geometric shapes used. Participating in CMCA’s Open Studio blog has given me the opportunity to show the public my workshop/studio, which otherwise would not be available to view.